Tom McAllister Berkeley Kite Festival. Sometimes — on the perfect Berkeley day, with the perfect bay breeze — there is no simpler or better pleasure than flying a kite. And once a year, during the Berkeley Kite Festival, you can partake in the pastime with thousands of others, with kites elevated to a transcendent, passion-filled art form. This Saturday and Sunday, July 27 and 28, head to Cesar Chavez Park (11 Spinnaker Way, Berkeley) and fly a kite. The annual event was started in 1986 by Tom McAllister, who set up his retail store, Highline Kites, on the Berkeley Marina in the same year. It started as a way to give back to the community while also garnering some attention for his new business, and in the first year there was an impressive, if humble, turnout of around five hundred people. 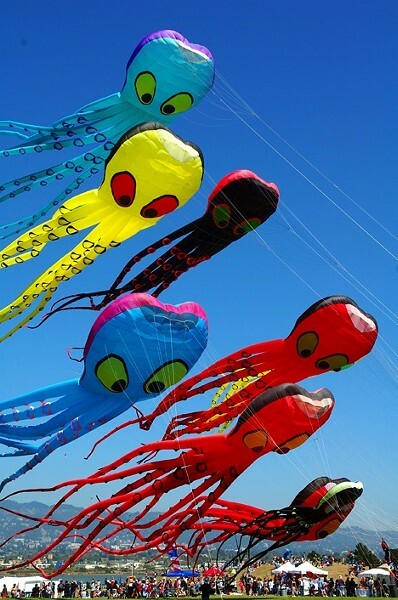 Less than thirty years later, the festival brings out nearly 25 to 30 thousand people to the Berkeley Marina over its two days, making it one of the largest kite festivals in North America, and flooding the sky with soaring kites. It's the kind of niche event that Berkeley is famous for. "One of the goals of the kite festival was to showcase the various forms that kiting takes," said McAllister. "Any hobby seems very simple on the face of it, but the more you learn the more you see how much diversity and craft there is in any activity." The festival has an impressive slew of kite-centric activities. 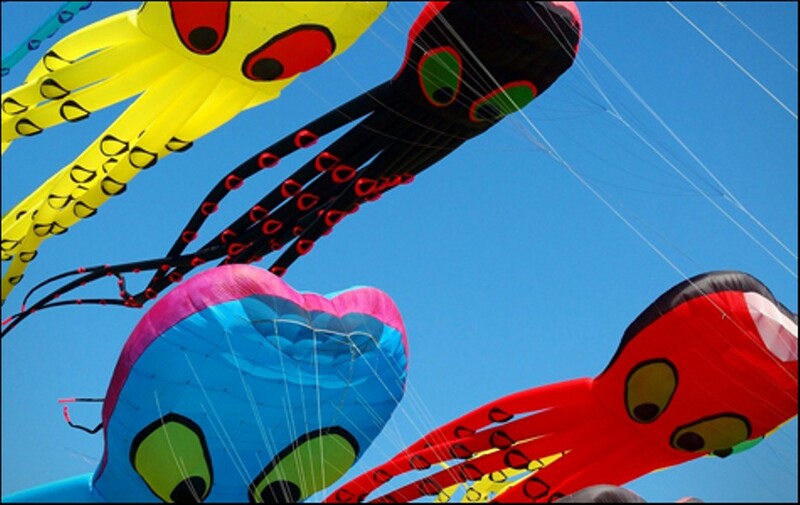 The Berkeley Kite Riders will fly sixteen 100-by-20-foot octopus kites, which — when all of the 35-pound kites are in controlled flight at the same time — "looks like you're staring up into the sky of a whole different world." The Sode-cho Kite-Flying Society of Japan will be flying their traditional Machijirushi kites, which are constructed traditionally out of fine paper and bamboo. Kite team ballets will perform choreographed kite dances to music — "a kind of cross between the Blue Angels and pairs ice skating," according to McAllister. For the amateurs, there will be kite-making workshops and flying lessons, while kids can enjoy candy, face painting, bounce houses, arts and crafts booths, a petting zoo, and more. Everyone is welcome to bring their own kites — small or giant, plain or bedazzled — to fly.